If you have ever been bitten by a greenhead fly, you know how awful it is! These particular flies are usually near the beach and don’t settle for one bite but will come back repeatedly until they drive you away. Conventional insect repellents like DEET work on mosquitoes and other bugs by disrupting their ability to sense CO2. But greenheads are also attracted by the movement, warmth, and size of warm-blooded animals, rendering conventional greenhead fly repellents ineffective against these nasty biters. 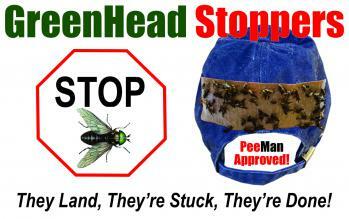 NEW Greenhead Stoppers can save your day at the beach or other outdoor plans. Simply apply one of the adhesive strips to the back of a hat and you’re good to go. The flies can’t resist the flesh-colored greenhead fly traps – they land, they’re stuck, they’re done. Make your summer days by the water fun again with Greenhead Stoppers! PeeMan Approved. 6 pack of super-sticky adhesive greenhead fly attracting strips. Simply apply strip to the back of your hat and go. When strip is full, remove, discard and replace. Take back your summer fun.